Raj Kumar - Video Raj Kumar is director of operations performance in product supply at Nestle Purina’s St. Louis corporate headquarters. He is responsible for the energy and water conservation and reduction of waste in Purina businesses. “I’d like to acknowledge former (School of Business) Dean John Navin, who worked with me on sustainability to help young students and coach them,” Kumar said. “I like to do the same thing for future students that was done for me – help them go in the right direction.” Due to his exemplary work in resource conservation and environmental sustainability, AEE gave him a Lifetime Achievement Award by declaring him a Legend in Energy in North America. Fred Irby III - Video Fred Irby III has been a professor of music at Howard University in Washington, D.C. since 1974. He is the coordinator of instrumental music, trumpet instructor, and founder and director of the internationally acclaimed Howard University Jazz Ensemble (HUJE). “I’d like to thank two individuals who truly inspired me to great heights – Susan Slaughter, a trumpet player recently retired from the St. Louis Symphony, and Dr. Dorothy Tullos, the best teacher that I ever had,” Irby said. He travels internationally giving lectures and charity concerts for disadvantaged children and families. David Williams - Video David Williams serves as a distinguished professor at the School of Policy, Government and International Affairs at George Mason University (GMU) in Arlington, Va. He is also the director of GMU’s Center for Organizational Performance and Integrity (COPI). Before joining the faculty at GMU, Williams served as the Inspector General (IG) for the U.S. Postal Service and served as IG for five other federal agencies. “SIUE was my road to the world,” Williams said. “I learned to speak, think and write in this special place. The power of diversity and education overpowers everything.” Williams served in the U.S. Army Military Intelligence and began his civilian career as a special agent with the U.S. Secret Service. Dr. Darryl Pendleton - Video Dr. Darryl Pendleton joined the faculty of the University of Illinois at Chicago College of Dentistry (UIC COD) in November 2002. He currently serves as the associate dean for student affairs and diversity affairs and clinical associate professor in the Department of Pediatric Dentistry. In addition, he serves as the director of the college’s Urban Health Program. Previously, Pendleton served as the director of multicultural affairs at the Marquette University School of Dentistry from 1994-2002. He also served as executive director of the Milwaukee Area Health Education Center from 1992 -2003. Pendleton will accept this award at the School of Dental Medicine Dean’s Scholarship Gala on October 15.o. Thelma Jean Mothershed Wair - Video Thelma Jean Mothershed Wair made history as a member of the Little Rock Nine, the African-American students involved in the desegregation of Little Rock Central High School in 1957. Brennen Wair, a student at Marquette University, spoke on behalf of his grandmother. “I just want to thank this woman for the path to school, so that my brother and I can have the education that we deserve,” he said. “She is a great role model.” She has spent her life championing diversity efforts. Wair has been the distinguished recipient of numerous awards, including the Congressional Gold Medal — the highest civilian award. She received an Honorary Doctor of Humane Letters degree from SIUE in May 2016. Thomas Niedernhofer - Video Thomas Niedernhofer’s 30-plus year career at the U.S. Army Corps of Engineers began in St. Louis. He is a member of the small group of volunteer “Rescue Engineers” across the country that supports the National Urban Search and Rescue (US&R) Response System. “There are great professors here – mentors, leaders,” Niederhofer said. 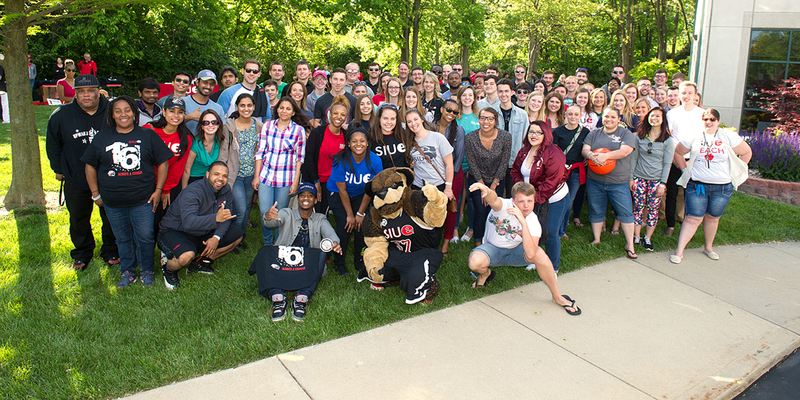 “SIUE does a good job of teaching individual students about being organized and regimented. You carry that on through life.” The US&R provides technical and operational support to the Federal Emergency Management Agency (FEMA) US&R program and other state, local and International Urban Search and Rescue Programs. Dr. Nelma Shearer - Video Dr. Nelma Shearer is a highly acclaimed and accomplished leader and innovator who is making an outstanding difference in nursing education, research and practice. Throughout her career she has been a passionate advocate for advancing the health and well being of older adults, and for advancing nursing education. “I was never introduced to nursing theory until I came to SIUE,” Shearer said. “We look at a person from their strengths, and you can’t separate a person from their family which is part of those strengths. Possibilities are endless when you accept the call.” She recently served as associate professor at Arizona State University and the director of its Hartford Center of Gerontological Nursing Excellence. Bill Luan - Video Bill Luan is a senior program manager and regional lead in developer relations team at Google. He is responsible for running Google developer outreach programs in the Greater China Region. “I got a great education, and it started in the basement of Lovejoy Library as a student worker in audio/visual,” Luan said. “I had an extraordinary, open-minded manager, Claudia Davidage. She told me to always do your best, make sure your information is verifiable and have integrity. She gave me the confidence to make things happen.” During the past decade, he organized many technology conferences and built a large community of developers for web and mobile innovations with applications being used by millions of users around the world.